Are You a Bean Lover? You see them in different colors - red, black, green, white, brown. They may be gas-forming but are cheap and soft. Anyone can eat these solo, mix with cereals or just pop into the mouth. These are just a few ways one can describe beans or legumes. But more than the adjectives, these foods are rich source of nutrients our body needs such as proteins, vitamins, and minerals, carbohydrate, and dietary fiber. Legumes are good sources of protein, particularly when taken in with grains which complement each other in terms of essential amino acid pattern or composition. Essential amino acids are protein components which the body cannot produce on its own. The body must have all the amino acids it needs to function in building and replacing worn body tissues. Legumes are also good sources of vitamins and minerals such as niacin, Vitamin B6, folic acid, phosphorus, potassium, magnesium and zinc. These vitamins and minerals help boost energy and growth of children. Legumes are rich in dietary fiber and generally have low glycemic index. Such attributes are important in the control and management of diabetes. Dietary fiber slows down the rise of blood sugar after eating, and thus, prevent hyperglycemia or the sudden abrupt increase in blood sugar among diabetic persons. Many advertisements have come out about foods rich in dietary fiber. Beans are one of the best sources of this fiber. There are two types of fiber based on their solubility in water, soluble and insoluble. The kind of fiber that is more abundant in beans or legumes is soluble fiber. Soluble fiber is associated with lowering of blood cholesterol, which is one of the ways to prevent heart disease. It also controls the passage of food in the gastrointestinal tract, thus, maximizing the absorption of nutrients. The 2012 Nutritional Guidelines for Filipinos (NGF) of the Food and Nutrition Research Institute, Department of Science and Technology (FNRI-DOST) recommends to consume fish, lean meat, poultry, egg, dried beans or nuts daily for growth and repair of body tissues. 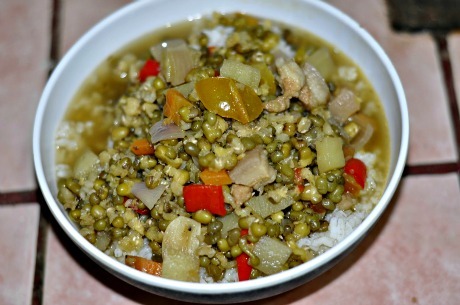 Munggo in munggo guisado, tausi with bangus, green peas in menudo or afritada, among others are some familiar ways of preparing legumes. And who could resist a cup of halu-halo with all the sweet beans? No matter how the beans are cooked, you'll surely love to eat them.